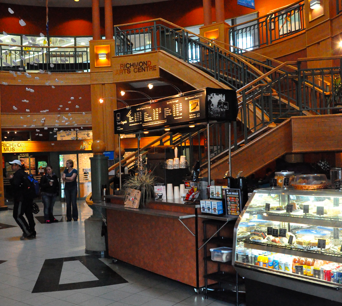 Our location on Granville is a popular and well-known spot to see Vancouver’s café culture up close. But did you know that Trees Organic Coffee and Roasting House has three locations around Vancouver and one in Richmond, uniquely blending into each neighborhood? Our café at 450 Granville Street in the heart of downtown Vancouver has been serving up a great roast (and teas, tasty sandwiches and delicious cheesecakes) since 1996. Whether you’re stopping in for your first cup of the day before heading to work or dropping in for one of our mellow music nights, our customers are helping carry on a Vancouver tradition. I had been a frequent customer of the Granville and West Hastings location, up until when I discovered that there was another location in Gastown… The cheesecake (and yes, I know – I’m weird – I *hate* cheese but *love* cheesecake) is definitely to-die-for. The decor at Trees Organic Cafe is pretty nice, and I have enjoyed a couple of evenings there just alone (ironically, always bumping into a well-dressed young blond guy who is reading on his iPad). Hmmm…walked into this rustic looking coffee shop and was knocked out by how authentic it is. Great vibe! Great atmosphere! Friendly staff! Excellent latte! The cheesecake I wanted was sold out though – “The Sin” Cheesecake….too bad! Maybe next time! I hear it is to die for! The bottom line for Trees Organic Coffee: Thumbs Up! Trees Organic makes such a fantastic cheesecake. And whenever I want to grab a dessert for my girlfriend and I, then I come and will always grab one. 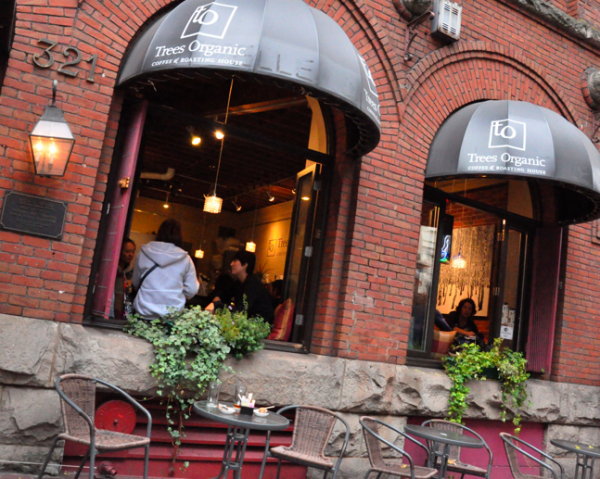 What’s interesting is that Trees Organic has several locations in downtown Vancouver, but this is a bit of a hidden gem and most people aren’t aware thatthere’s one in Richmond. Are you a loyal customer of Trees Organic Coffee and Roasting House? We think that loyalty should be rewarded. Starting this month, try out the Trees Coffee RewardMe program and earn a free coffee, free slice of a delicious cheesecake or more! When you wander into any of our Trees Organic locations at Granville in downtown Vancouver, Gastown, Yaletown, or at Richmond Library, you’ll see a little sign by the customer register with a scannable QR code (it looks like a black square made of pixels. Scan the code with your smartphone. To do this, you’ll need to download the free RewardMe app – it takes about 30 seconds or less, and as we say, it’s FREE! The RewardMe App works for iPhone 3GS and newer, and all Android Phones. Next, scan the QR code and you’ll instantly get points just for checking in. How many points can I earn and what can I get? 10,00 points = Whole Free Cheesecake! It’s easy to get your points to add up. You can even get RewardMe points for referring your friends. The more you use it (and the more your friends use it) the more free stuff you get. We’ve included a quick video demo of how to use the RewardMe app above. Have a look and we hope you’ll take part. Thanks again for being a loyal Trees Organic customer and we’re pretty sure that once you start using the program, it won’t be long before your next coffee is on us.